I am delighted to welcome writer Cileme Venkateswar to anthropod. This is the third post in my series on doing fieldwork with kids, and in it Cileme (who I introduced in Part II of this series) reflects on what it was like to be the kid of an anthropologist who travelled a lot to do fieldwork. You grow up differently as a kid of an academic, that’s just kind of a given. There’s a certain drive you have, a desire to know more about the world, a determination to succeed in the things you find joy in that I’ve only ever seen so fiercely in children whose parents have similar professions. But being the kid of an anthropologist in particular? Now that’s a whole other ball game. I can safely say that I wouldn’t be who I am now in any way whatsoever without my mother’s influence as an anthropologist. I’ve learned some of the most important life lessons I carry with me as a now almost 21 year old from the anthropological teachings I witnessed and the research I was privy to as a child. Growing up, it was just me and my mum and so when it came to her doing fieldwork, there weren’t a whole lot of options for what I would do. It was simple. I’d just go with her. Travelling from a young age is its own lesson. Before the age of 15, I had been to New Zealand (obviously), Australia, India, Thailand, Singapore, Malaysia, the UK, the USA, Nepal, Portugal, Germany, France and quite possibly more that I don’t even remember. It ingrained in me from a very young age the vastness of the world and how much more there was out there. I was surrounded by so many different languages and cultures, heritage and traditions that even if I didn’t understand them, I was immediately curious about how their lives differed from my own and how much diversity existed around the globe. Kids aren’t inherently patient, not in the slightest, but annual 12 hour plane rides, long taxi commutes to various places in numerous cities, waiting in long queues, having to amuse myself for several hours during book launches, research interviews etc., certainly helped improve what little patience I had as a child! It also produced a remarkably active imagination. I learned to sit in my own corner and make up stories in my head. I carted my imaginary friends around the world with me, having my own adventures in each new location we visited. I began a growing collection of books picked up cheaply in roadside book stalls and airport shops that helped foster a love for storytelling, complex characters and literature, a love that remains today as I study English and Creative Writing at university. But one of the things I’ve only recently started to appreciate having learned solely from the situation of my mother’s work in academia, is my ability to converse with anyone, especially adults. Adults speak to kids a very particular way, stick to a select few conversational topics and often use that annoying, high pitched, slightly condescending tone of voice, laughing at the interesting and often naive answers they receive to their questions. Children rarely notice, but as a child of an academic, you’re constantly surrounded by adults in scenarios of meetings, pot luck dinners, fieldwork, or random encounters during a normal day. The asking about school, the ‘what do you want to be when you grow up’ and the interest in what books you’re reading grows old pretty quick when you have several pot lucks a semester and you’re encountering the same adults each time. For a while, it’s easy to be amused by the luxury of getting to watch Nickelodeon and Cartoon Network on Sky TV, or running around playing tag outside with the other kids. But eventually, it reaches around 10 o’clock in the evening and the only shows on the television are reruns of episodes you’ve already seen, half the other kids are either asleep or have gone home, the high schoolers are bored of babysitting you and have taken to answering questions about their own subjects and university applications, and you meanwhile want another slice of the pavlova on the dessert table but unfortunately, there’s a group of lecturers from a department you’ve never heard of standing there and you have no segue into asking them to help you reach the cake tin. It’s around that point that you realise you’ve got to bridge the gap between child and adult and just find a way to talk to them without them looking down at you like a silly little kid. Somewhere between the ages of 8 and 11, I suddenly gained the ability to proficiently and fluently interact with adults outside of the regular ‘child questions’, whether I knew them or not and whether we had common ground or not. I talked about travel, about what they might be researching and what my mum was researching, about where in the world they’d been and where in the world I’d been, about the things I didn’t understand in the books I read, about the stories I was writing, about whether I wanted to be a journalist or a novelist — anything and everything I could hold an almost adult conversation about. It never occurred to me that this was a ‘skill’ of any sort until I was much older. Only in the last few years of my life have I realised that people my age don’t just hold conversation with adults much older than them (even now with so much more to talk about), that it isn’t normal to be able to go up to a perfect stranger and find common ground, sparking a friendship. I’ve had so many friends pull me aside after a seamless conversation with a tutor or a lecturer and whisper ‘How did you do that? How did you know what to say?’ It’s so much easier now, as I can converse about politics, history, literature, climate change, generational differences, activism … but it all stemmed from the ability I decided to cultivate as a child. Some of the things that have shaped me the most profoundly are the experiences I’ve had because I accompanied my mother in so many aspects of her job. I’ve played soccer with boys living in slums in India even though they didn’t speak a word of English nor I a word of Bengali. I’ve spent half my childhood wandering around university campuses playing make believe and dragging those same invisible friends to every country I had the privilege of visiting. I’ve been changed and impacted by each and every culture and experience I was enveloped in and would be so much lesser of a person without it all. This was all a part of my life out of necessity — me going with my mother was the only option either of us had for when she had to travel or go to research. But to any and all academics out there with kids: honestly. Even if you have other arrangements you could make, don’t rule out taking your kids with you, especially before they reach high school. Getting to see the world as a kid is unlike anything else, and they learn lessons that are invaluable and unteachable in any other circumstance. Believe me. We become better people for it. Great post – wish I’d had these tips when I was working on my thesis. In a recent lecture at ANU, the esteemed research education expert Dr Margaret Kiley claimed that if we set out to design the Australian PhD from scratch we wouldn’t start from here. The PhD assessment (in most cases, a long form thesis), she argued, does not not necessarily develop the full panoply of skills we expect in a working researcher, inside or outside of academia. If that’s the case, what should I spend my time on? At the moment I spend most of my time reading and writing because that’s what I’m being assessed on. Should I be doing more? 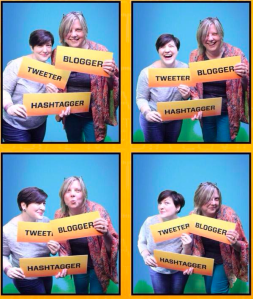 Joyce Seitzinger and I being silly in a photobooth for the Canberra Tourist board. What is it really like to be an anthropologist? I am at that point in my life where I need to decide what it is I want to do with my life career wise and I have a shortlist of things I love to do and would love to do as a career, Anthropologist is one of those things. I have done a bit of research into it but what I would really like is to know what it is really like to be an Anthropologist on a day to day basis and in the long run? I would like to know this so I can decided if this is what I really want to do so I can choose my study for next year at Uni. I would greatly appreciate any information you can give me on the life of an Anthropologist. Hannah said the replies I sent her were helpful and gave her a lot of food for thought in terms of her future career. I asked her if I could share them on my blog in case other students might also find them helpful. She agreed, so there they are! Academic Writing Month 2013 starts today and I’m participating this year for the first time. For some reason it passed me by last year, but for the past week my Twitter feed has been filled with people declaring their writing goals and encouraging one another as they gear up for the month-long writing marathon that is #AcWriMo. The purpose of #AcWriMo is for academics to prioritise writing for the month. One of the things I like about being an academic is that I get (paid) to write a lot. I don’t like the pressure put on academics to publish – what Thesis Whisperer Inger Mewburn calls the academic performance culture – but I love writing and the writing process, so I’m keen to share experiences with others for the month. The first two goals will be completed in the next couple of weeks and I will use goals 3 and 4 to help me achieve them. I might not achieve the rest of the goals as I’ll also be marking Honors theses before heading to Chicago then taking 2 weeks’ annual leave after the AAA meeting. I will probably start on goal 5 while I’m on annual leave, as like Anne Galloway I’m keen to try out Inger Mewburn’s strategy for Writing a Journal Article in 7 days. Also, I can never really ‘switch off’ so I’m sure I will achieve a lot of thinking about goal 6 even if I don’t write those thoughts down. For me participating in #AcWriMo is more about joining an online discussion of academic writing and the writing process than meeting specific goals. I didn’t achieve any of my goals today, for example, but I did spend one Pomodoro doing research for my AAA paper and gave a very short presentation at a seminar on using social media in the classroom at Victoria University (look up #VUWteach on Twitter for live-tweets from the seminar), so I feel like that’s good enough. I will achieve some of my goals and make progress on others and look forward to chatting with others about their progress on Twitter. UPDATE: Since I posted this, the AAA has released a mobile app for Android and iPhone/iPad users. The AAA Annual Meeting Mobile App replaces the hard copy version of the programme in an effort to help make the event ‘greener’. I will probably give this a go before heading to Chicago later this month. I’m excited about the 2013 American Anthropological Meeting in Chicago next month. I am presenting a paper as part of the session The Spatial Politics of Enclosure: Creating Persons and Publics. Abstract: Hope is a prominent theme in discourses of development. Through its focus on social change, development provides a way of engaging with a hoped-for future of social justice and equality that is embedded in, but moves beyond, present social, political, and spatial enclosures. In this paper I explore how women living in bastis and settlements in Kolkata (West Bengal, India) and Lae (Morobe Province, Papua New Guinea) negotiate space for themselves, their families, and the wider communities in which they live by participating in grassroots-level development initiatives. I discuss how the various social and spatial arrangements ­ in particular, physical and societal enclosures facilitated by structural inequalities ­ that shape women’s lives in each of these cities simultaneously constrain and provide a basis for their actions. I argue that whether or not they achieve their objectives, such initiatives foster a sense of possibility and movement within and beyond the social and physical spaces these women inhabit. How to make the most of the meeting? AAA Meetings are always well-attended with multiple streams of panels running from 8am-9.45pm most days. Based on past experience I know that good planning is essential in order to make the most of my time at the conference. There are a range of new tools available now to help plan everything, including the AAA’s personal meeting scheduler and of course Google Calendar. Kerim has written a useful blog post on Savage Minds combining these two process into one #AAA2013 Google Calendar. A quick look at the preliminary schedule suggests it’s going to take me a couple of hours to work through everything. The search function of the preliminary schedule seems a bit clunky – for example, looking at the Melanesia Interest Group in the ‘search by section’ function only shows the group’s annual meeting and does not list the session above as we have been sponsored by the American Ethnological Society. Also, because the schedule is only ‘preliminary’ I can’t read many of the abstracts to get an idea of what the papers will be about. I haven’t started planning my time yet and might end up doing so the old-fashioned way with pen and paper on the longhaul flight from NZ to the USA (although this might not be practical with a 20-month in tow). I am keen to hear from others about conference planning – what tools or apps work well, and which should I avoid? If you are going to the AAA 2013 Meeting, how are you planning your time?